Bullett drilling machinery are built by CWI Woodworking Technologies to be best in class machinery with the features, performance and quality that serious users are looking for whether in hobby, educational or commercial industries. CWI has developed an incredible line up of drill presses, line boring and construction boring machinery as well as some very nice bench top and floor model mortising machines. 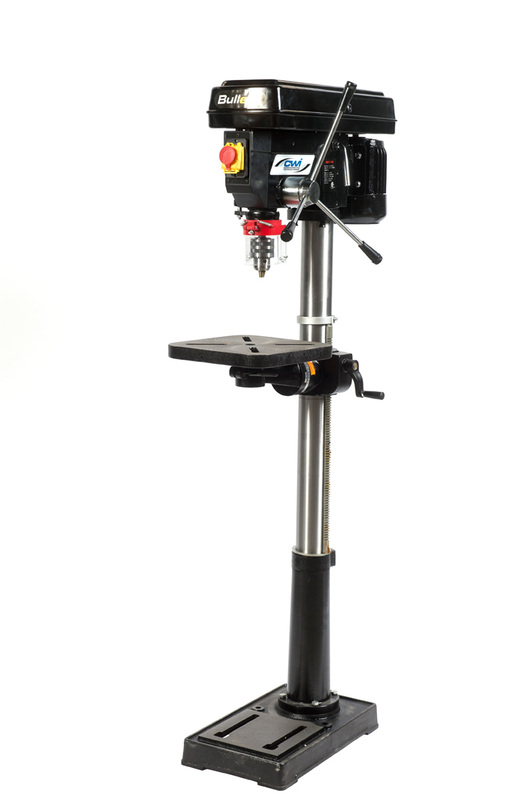 The Bullett CWI-DP200 is a very nice 17” floor model drill press with 12 drilling speeds from 340 RPM to 2800 RPM. 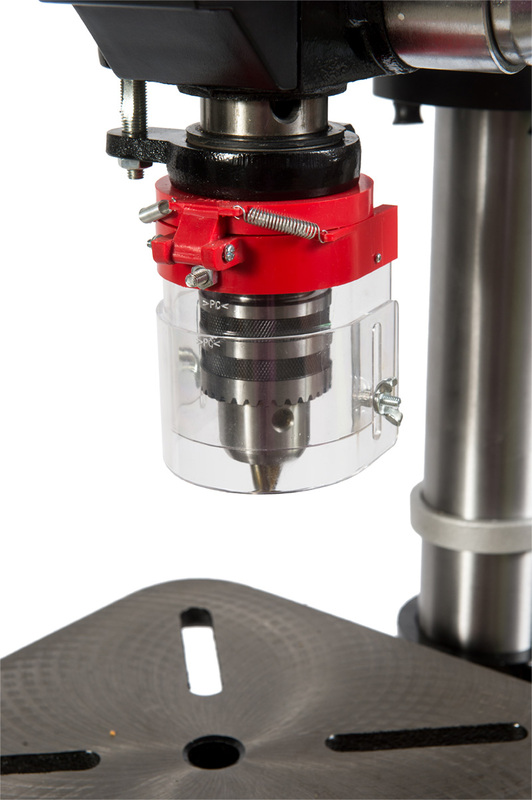 This heavy duty drill press uses a totally enclosed fan cooled industrial 3/4 HP 12 amp motor operating on 110 volt which drives the three cast iron pulleys for easy speed changes and much less vibration than aluminum pulleys. 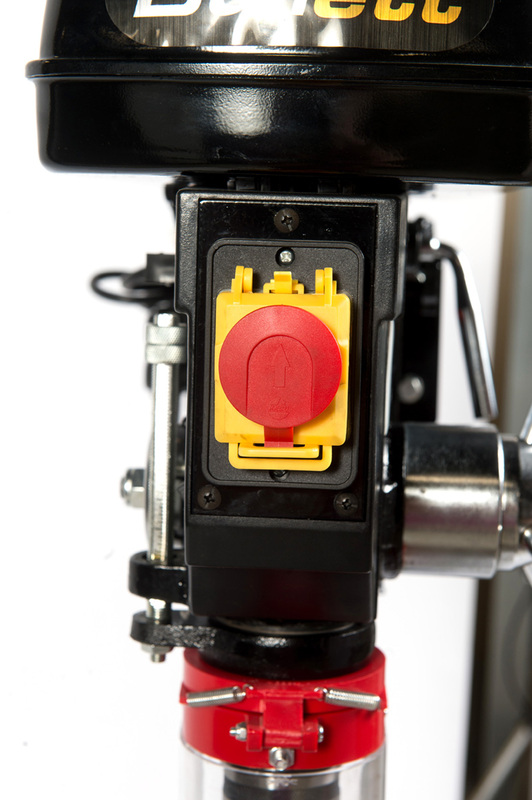 The magnetic line interrupter safety switch is excellent for educational settings or anywhere safety is a big concern in that it will not allow the machine to automatically re start after the power is lost or disconnected. The switch will not re engage without being activated by the operator. The JT3 5/8” steel chuck mounts with a #2 Morse taper snug fit into the heavy duty quill assembly. 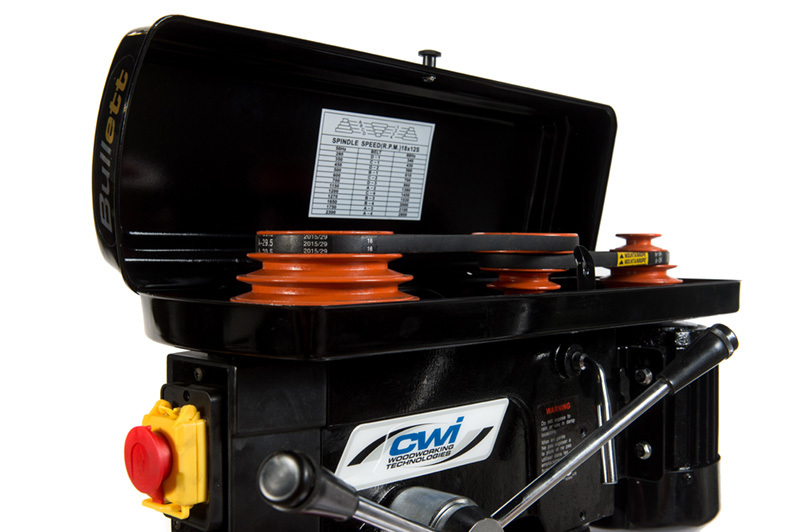 The CWI-DP200 is perfect for most drilling operations in a wood or metal working shop and weighs in at just under 200 pounds of cast iron and steel. It features a very large 12” x 12” square cast iron table which rotates and tilts to 45 degrees in both left and right hand rotations. The table operates with a hand crank on a rack and pinion height adjustment on the column for easy table height changes and locks firm to the column with a lever at the rear of the cast iron table housing. 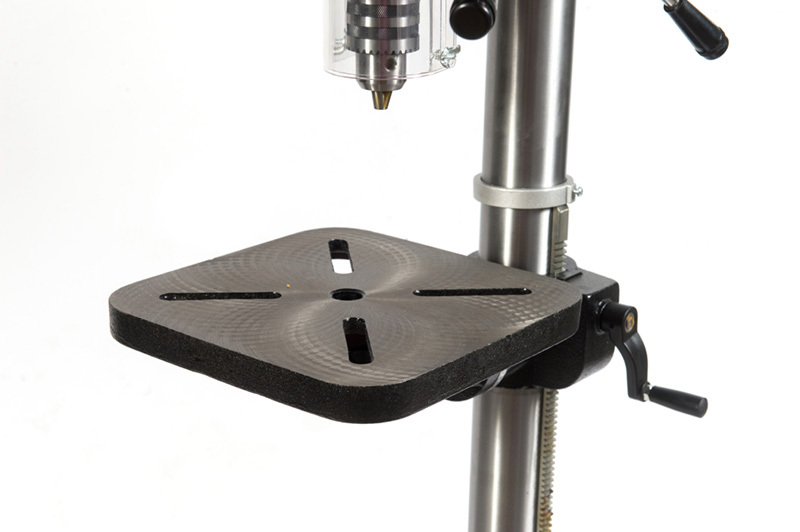 There are a number of mounting holes for jigs and fixturing in the table for both woodworking and metal working projects. 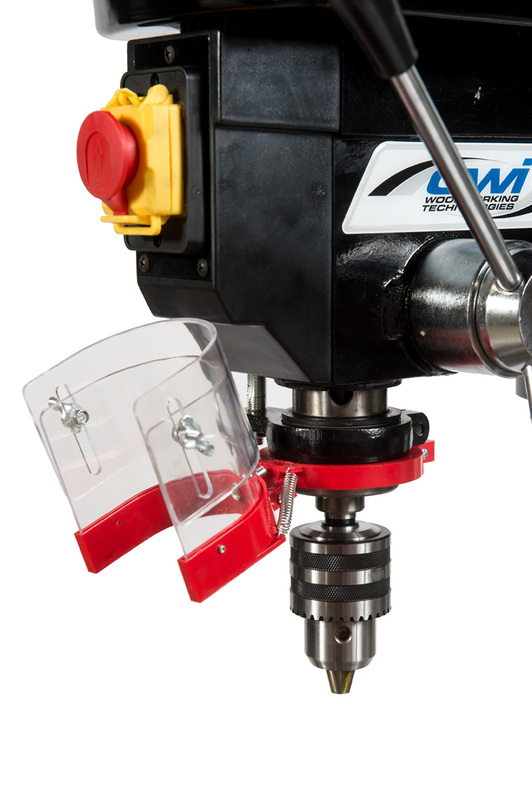 The Bullett CWI-DP200 also has some great conveniences too like a work light (bulb not included) and a battery operated laser attachment for precise aligning of the drill bit to the workpiece starting hole. The drill chuck has a drilling depth stroke of 3 3/8” and uses a very solid positive depth stop mechanism that is very easy and accurate to work with. Also for excellent safety the CWI-DP200 comes with its own see through plastic chuck guard that easily flips out of the way for drill bit changes. 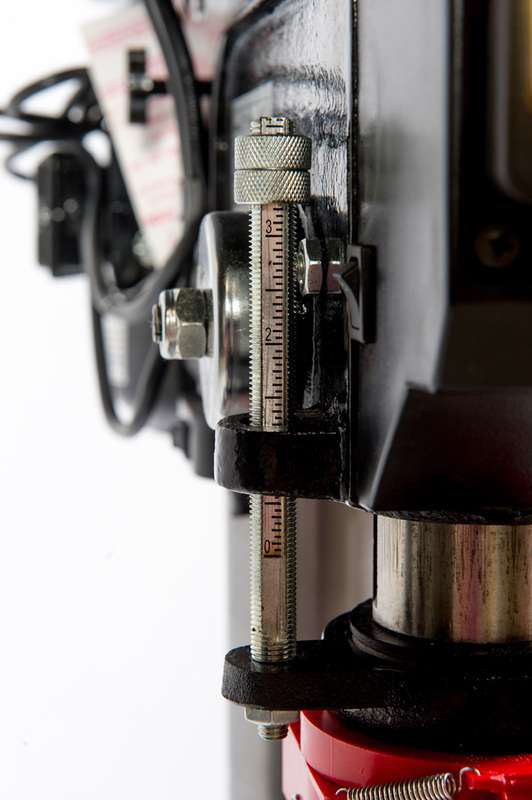 Bullett drill presses are built with heavy construction for continuous use but also with safety and performance features that are sure to satisfy any hobby, educational or commercial needs. Browse the product archive. Type: Drilling Equipment. Brand: Bullett. Bookmark the permalink.